Yosh Han is the independent perfumer success story. 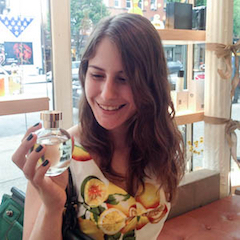 Her journey couldn’t be further from the typical path to the perfume industry. Han was born in Taiwan, not Grasse; her mother was an ikebana practitioner, not a third-generation perfumer. No privileges. No shortcuts. She is utterly, awe-inspiringly self-made. 20 years later, Yosh has achieved almost unparalleled success as an independent perfumer. Her fragrance line is carried by Barney’s New York; she created a fragrance collection for Anthropologie in 2013. As far as I’m concerned, no list of pioneering female perfumers would be complete without her on it. Acknowledging that one of the most acclaimed fragrances of one’s career resulted from a collaboration is highly unusual in an industry that tends towards secrecy and hyperbole. I can think of more than a few “master perfumers” who keep any outside contribution quiet for fear of damaging that Master Perfumer image. Crediting her collaborators rather than taking full credit for herself only deepened my respect for Ms. Han. Yosh Han is such a charismatic person! I’m happy for her success. Ginger Ciao is one of my all-time favorite perfumes (I have a bottle of it), which is actually a big deal since I’m usually not a big fan of indie perfumes when it comes to actually wearing them. Ginger Ciao is my favorite Yosh, too! It’s apparently also the name of the main character of her yet-unpublished novels. I know exactly what you mean- there are so many independent lines that I’m dying to support in theory, but very few of indie brands actually make it into my collection. CBIHP Burning Leaves might be the only one at the moment, actually. I reaaaaally want to have her read my aura one day. I love Sottile and Ginger Ciao! That would be SO COOL. I have a bad feeling that my aura looks like a light dusting of cat hair. That’s EXACTLY what I was hoping to accomplish with these posts, Sun Mi! I’m beyond thrilled to get to introduce you to Yosh. Do I have your mailing address? I have a Yosh sample set lying around that I would be happy to send your way! I love Yosh Sottile. It’s on my list of FB – so far I’ve only scored small decants, but I’m ready now for the full bottle because – spring! Yosh Han is a true visionary. What a great story. So glad you are sharing these profiles of these talented and awesome women!